Mackerel is an oily fish, with a strong distinctive flavour. It is known for being a popular addition to barbecues, but don’t let this fool you - there is room for the humble mackerel on more refined menus too. Whether incorporating the fish into your starter, main, or just a light snack, this collection of easy mackerel recipes all offer simple preparation without compromising on taste or appearance. Take a look at our guide too, for more advice on how to cook mackerel. Pimp up your next picnic with James Mackenzie’s mackerel Scotch egg recipe, or for an elegant starter Kevin Mangeolles’ mackerel with compressed watermelon and horseradish is bound to impress. The flavours of horseradish and mackerel greatly complement one another, and it is a popular pairing in this collection. 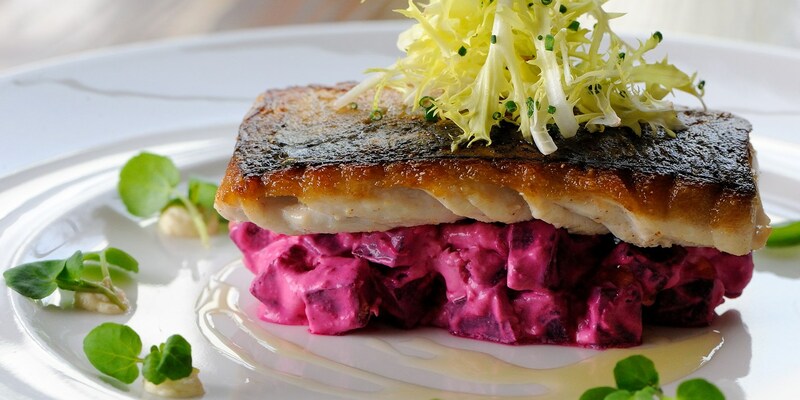 The happy couple are also combined in both Robert Thompson’s vibrant mackerel ceviche and Dominic Chapman’s truly stunning seared mackerel, which is served on a bed of beetroot relish.